Human beings live a linear existence. We travel in one direction through time — from the past, through the present, toward the future. So conventional wisdom says that the future is impossible to predict. Its says the future is unknowable because it’s not here yet. Predictability of all the variables. The reason it’s so hard to predict the future is that a) we rarely understand all the details involved, and b) too many unexpected things can affect our prediction. The good news is this: Both of those can be improved — we can a) gather more details and b) anticipate the unexpected. And if we do that, we can predict the future. The further down this list you go, the more information you need, and the more the variables that can get in your way. A "Safe" prediction, for example, is reasonably obvious. You need only general information, and it doesn't have any significant variables. A "Pinpoint" prediction, on the other hand, takes a lot of thought — detailed information and variables that need to be weighed up very carefully. Have you ever noticed how bad old sci-fi looks? Take a show like Star Trek for example. Remember the doors? On the original series (I saw reruns), which was set a couple hundred years into the future, the doors of the ship were designed to slide open as someone stepped up to them. They even had a cool "whoosh" sound. It was a great idea and a clever “futuristic” innovation. But by today’s eyes (only a couple decades — a fraction of the future — later), it looks ridiculous. We've got better technology at the supermarket (no cool sound, though). How could such creative people be so wrong? Because the prediction was made with 1960s information. The creative team imagined the future — but they were missing vast amounts of interim progress. In the years since the 1960s, we’ve seen technology that far surpasses what they imagined. In short, the they didn't anticipate all the variables involved. They couldn't. And because their story was set significantly in the future, the variables compounded. That show is going to look increasingly ridiculous as time goes on. Just as older sci-fi looks increasingly primitive today. The future will be influenced by inventions and information that have not even been imagined yet. So the further into our future we attempt to predict, the greater the chance we’ll be wrong. Variables we can't see can throw our predictions off course. All predictions of the long-term future are wrong. It's simply impossible to predict, because we don't know what we don't yet know, so we can't adjust our prediction for it. That means that anyone who tells you the world is going to end, or the Earth is going to blow up, or melt, or get overpopulated, or run out of food... is necessarily, automatically wrong. They're making predictions without factoring in all the variables. What we can do, though (and what I suggest we get good at) is make short-term predictions whose variables we can control. What is the one element of your life you can most accurately predict? You. Your future. Think about it. You have access to just about all the information of your life, and because you’re the one living your own experience, you’re in a unique position to control the variables of your life. And if you’re completely honest with yourself and start looking at your life from the widest possible vantage point, you will be able to anticipate the variables that could otherwise broadside you. For example: What do you eat every day? Is it a healthy diet that works to maximize your body's processes? Or is it junk food that’s pumping your body full of chemicals it doesn’t know what to do with? From that alone, it’s pretty easy to make some Trend predictions about how your body will operate 10, 25, 50 years from now. What about your career? If you recall from the previous article, it takes about 10,000 hours to master something. Somewhere inside you there is a dream, a vision, a passion. How much time are you devoting to it? If you’re not devoting time every single day, you’re not adding up those hours. It’s pretty easy to predict whether you’ll achieve that dream or not, isn’t it? The same principle can be applied to your relationships, your kids, your exercise regime, your general level of happiness, your political standing, and so on, into every aspect of your life. So let’s imagine that you look at your life and objectively predict that you’re on a course for some sort of calamity. Many years ago, I was a smoker, so let’s use that example. After five years, I’d developed a pretty nasty cough. The prediction was obvious. If I kept smoking a pack-and-a-half a day, I would continually damage my lungs, and cause significant problems for myself when I got older. But the variable was under my control. I could stop lighting up. I could simply decide to stop smoking. I could prepare myself for the narcotic and psychological withdrawals. I could make contingency plans for when I really really really wanted one, or what I’d do in those social situations where it was habit. And that’s what I did. Over seven years ago, I learned that if I stopped smoking, my lungs would start healing themselves immediately. I learned that after 48 hours, all nicotine will have left my body, and that in 10 years, my body will have refreshed itself as if I had never been a smoker. Because I controlled the variables, I could control the prediction of my future. And I could make it come true. The fact is, I could predict my future either way. It’s a choice. And the choice is yours. And by making the choice to predict my future, I’ve been a non-smoker for 7 years now. I can predict a much longer life thanks to that. There are still some unknown variables that can affect that prediction, but if I want a long-life prediction to come true, those other variables are under my control, too. Make a prediction you can control. Gather all the information, and assess it honestly. Determine and account for every possible variable. Make Pinpoint predictions only for the short term, and Trend predictions for the longer term. Accuracy is determined by a) how honest you are, b) how carefully you've thought it through, and c) how far into the future you've predicted. 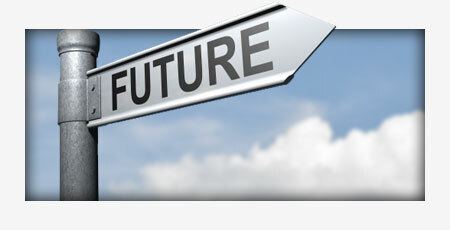 If you make a prediction you can control, then you have the power to make that future happen. If you make sure to look at all the information honestly, you will have the ability to accurately predict the likely outcome. If you look at all the variables, you will see (likely and unlikely) events that might happen to derail your prediction, and you can create contingency plans. If you predict carefully, you will see your future. Yes, unexpected variables can appear that will derail your prediction. But the more honest you are with yourself, the greater control you have. And this applies not just to your own life, but to any prediction you make. I'd like you to take your biggest single goal, or your greatest passion in life, and predict your future. Consider the information as it currently stands. Look at all the possible variables, from the expected to the unexpected. What's the current Trend? To what level of accuracy could you predict your likely outcome? The more honest you are about the information involved — how honest you are with yourself — the greater your accuracy. Now look at where you want to be, and consider what variables would need to change to make a successful prediction of your goal. It's that simple, really. You can make huge predictions incredibly accurately. The more you control that information and those variables, the more detailed a prediction you can make. Start by making Safe prediction. Add more detail and complexity to see the Trends in your life. Then make Basic predictions about your future. Gradually develop Pinpoint accuracy. As you start to see just how well you can predict your life, you will begin to see just how adjustable your future really is. You can predict it. You should predict it. It's your life. It should be exactly what you want it to be. Which means that will _never_ be able to make pinpoint-predictions regarding the weather by collating _all_ the information. It is my guess that it will be possible to predict with increasing accuracy as the meteorologists’ models of atmospheric phenomena grow steadily more complex. Thanks for the comment, Andrew. But we should bear in mind that even Heisenberg was working without the benefit of future technologies. “Never” means “at no time in the past or future”. Anyone who suggests they can know what will or will not be possible in the future is automatically wrong, because the future will be influenced by inventions and information that have not even been imagined yet.